I recently spent a night sleeplessly unable to erase an etching by Albrecht Durer from my mind. The etching illustrates two men working together around a table. The man on the right is drawing a picture of a lute in perspective on a vertical easel. The man on the left is holding a pointer at the end of a string; the opposite end of the string is weighted and threaded through a screw eye in the wall behind the artist. I found this to be an inventive way to accurately render 3D objects in perspective. I’ve wished to experiment with this technique but was certain I would not find a helper to hold the pointer. I lay in bed imagining various ways to clamp the string to the subject to be drawn. After several iterations of an idea I realized I could mount a laser pointer to a tripod thus eliminating the string holding helper! What a revelation. This time-lapse video is of my first attempt playing with this idea. I mounted the laser pointer to a tripod and created a hinged door easel which swings the picture in and out of the laser pointer’s beam. The process is relatively clear. Swing the door out of the way of the laser, point the laser at a feature of the object, close the easel in front of the laser beam, mark the point on the canvas, and repeat a zillion times. This experiment proved a feasible way to draw most anything visible in perspective. I found myself with time to experiment with some ideas I have been contemplating lately. Here is the result of one, tracing photographs with a mirror. I realize this has been done a million times before me. I understand certain people would suggest using a mirror is cheating. I am aware of other, similar ways to accomplish this type of assistance. All that aside, I simply wanted to personally experience the task to gain a clearer understanding of what is involved. First, tracing is not as easy as it seems. I quickly learned the apparatus must be precisely and rigidly constructed. My first attempt had a misaligned reflection which varied depending on what edge of the mirror was used. Second, it’s easier to trace with one eye closed – especially if the mirror isn’t situated precisely. The video is of my second effort which is also the first complete drawing. The first interesting thing I found to trace was a frozen pizza box in the recycling bin. After adjusting the rig I wanted to draw a portrait, but I couldn’t find a loose portrait of the appropriate size. I headed for my stickers and postcards drawer with hopes of finding something, anything, to trace. I swear I have some Salvador Dali postcards in there somewhere. I found an envelope with a bunch of Spice Girls pictures. I wanted a portrait. The first portrait I found, Ginger followed by several group shots, then a another close-up of cruddy Ginger. Another Ginger. By the time I got to my girl Mel C I was like, “Good enough”. Tracing the photo required almost an hour. I could have eyeballed it freehand in much less time, but without the precision. I also feel the freehanded drawing would be more dynamic and interesting. Often the simplest things fascinate me. Lately I’ve been thinking a lot about the camera obscura and the various parts the camera obscura played in history – especially art history. I always understood such a device was possible and that it was a simple device. I never imagined 5 minutes in the basement and a UPS box was all I needed to make such a thing. Let me rewind. I’ve been busy working on making rustic electrified table top lamps for a family wedding coming in the Summer. More on that in future posts. I have all my electronics equipment sprawled througout my workshop along with bits of trees and tools. I decided to tidy up the basement but, looking at my workbench, my eyes went straight to my helping hands with magnifier. Magnifier! Forget cleaning! I quickly removed the magnifier from the helping hands and began to search around. Box. Box. Box. I found a small, empty UPS box. I traced around the magnifying glass, grabbed a carpet cutter and cut the appropriate sized hole for the glass lens in the box. I cut a rectangle out of the opposite end of the box and taped the first piece of white paper I found laying around over the hole. 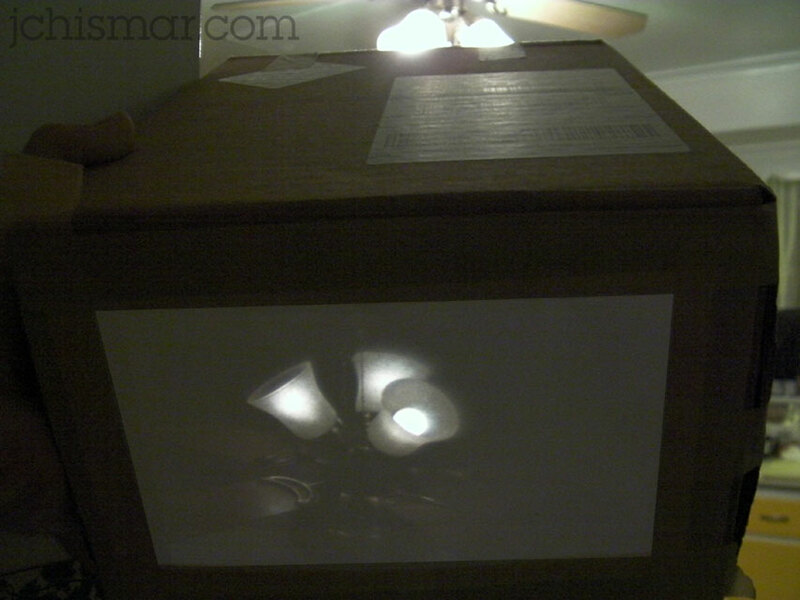 I directed the lens end of the box at a lightbulb and the white paper illuminated like a TV displaying a lightbulb! This is one of life’s moments I will never forget and this won’t be my last experiment, for sure.